If youâ€™re looking for a midsize/compact truck with a gazillion choices, the Tacoma fits the bill. Some 14 choices of configurations are available; surely, there must be one to fit your needs. Available in Regular Cab, Access Cab (extended), and Double Cab (crew) body styles, the Tacoma comes in two-or-four-wheel drive. Regular and Extra Cabs come with six-foot beds, and Double Cabs offer a choice of a sorter five-foot or six-foot box length. Our test vehicle was the Access Cab 4×4, with Toyotaâ€™s V6 engine. The base engine in the Tacoma is the 2.7-liter, 159-horsepower inline-four, mated with Toyotaâ€™s five-speed manual transmission. One can opt for the 4.0-liter V6, with 236-horse; standard on the Double Cabs and optional on4-WD Access Cabs. Paired with the V6 engine is either a six-speed manual or five-speed automatic transmission. Our test Tacoma came equipped with the automatic. Standard safety features on the Tacoma include four-wheel-anti-lock-brakes with electronic brake-force distribution and brake assist, stability control, traction control, side-impact/side curtain airbags and active headrests. This next statement is, of course, coming from a truck fan, however, if youâ€™re interested in learning about how up-to-date and comfortable these trucks can be, take a test drive. You might get hooked. 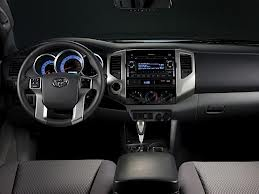 New for 2013 in the Tacoma is Toyotaâ€™s next generation audio system. The latest in digital technology includes navigation, Toyota Entune services, XM/Sirius radio (90-day trial subscription), HD radio with iTunes tagging and txt/email-to-voice, all playing or premium quality through a JBL Green Edge system, which helps to lower the power output effecting fuel consumption. The sound comes from all around through 7 speakers. The AM/FM Satellite radio comes with a single-disc CD player, built-in Bluetooth/hands-free and steering wheel controls. The 2013 Toyota Tacoma continues to offer more each year, enabling it to remain the most popular of the midsize trucks. The â€˜compactâ€™ (think Ford Ranger) pickup is no longer available on the market, so one starts off with a midsize truck. Named Most Dependable Midsize Pickup by J.D. Power & Associates in 2011, Tacoma also received the Best Overall Value by Intellichoice. The 2013 Tacoma was also named the best pickup in its class, and best for rugged terrain, durability and reliability by New Car Test Drive. Owning the segment, Tacoma sells more than 100,000 vehicles a year, causing other manufacturers to get out of the market. In addition to the demise of Fordâ€™s Ranger pickup, look for the disappearance of the Nissan Frontier, Chevy Colorado and GMC Canyon. The last major redesign for Tacoma was in 2005. A new look in/out appeared in Tacoma for 2012, along with an updated audio system. Other additions, including a Limited Package appear for 2013 and include 18-inch chrome alloy wheels, chrome grille trim and rear bumper, SofTex-trimmed heated seating, auto-dimming rearview mirror with camera display, outside temperature gauge, HomeLink and dual sun visors. Buyers can choose from 14 different versions of the Tacoma (up one from 2013), including 4×2 regular/access cabs, PreRunner 4×2 Access, Double (4-cyl., 6-cyl. ); 4×6 Access, Double; X-Runner V6, 4×2 Access and Base V6, 4×4 Dbl in two bed lengths. Air Conditioning is standard on all Tacoma versions, as is brake intervention in place of a mechanical-type limited-slip to help reduce wheel-spin (with the exception of the TRD off-road model). Toyotaâ€™s TRD (Toyota Racing Development) models offer several accessories to improve road performance, on/off-road. New to the version is the TRD Baja Series, featuring high-performance Bilstein off-road shocks, special Eibach springs, 16-inch headlock wheels with BF Goodrich /All-Terrain T/AKO tires, sports exhaust and special graphics. Our test Access Cab 4×4 model adds a few more standard features, including power windows/locks/mirrors, bucket seats, functional consoles, six-speaker audio. Owners will not want for extras in the Access Cab version. Four-wheel-drive is available in Regular, Access and Double Cabs (both engines), as are automatic or manual transmissions. While the interior of the Tacoma Access Cab we drove was comfortable, it isnâ€™t luxurious, by any means. In fact, the IP and control center seemed a bit dated in styling. The one CD unit might be more about drivers utilizing iPod and iTune equipment these days. CDâ€™s are quickly becoming obsolete; the latest victim of upgraded technology. Cup holders are situated in the center console, with one in the door, and the center console is large enough for a laptop. Options on our test Access Cab 4×4 included the Convenience Package (rear privacy glass, sliding rear windows, steering-wheel-mounted audio controls/cruise, power mirrors, remote keyless entry, $1005); and the TRD-Off-Road Package (S$5 equipment, locking rear differential, off-road suspension with Bilstein shock absorbers, engine skidplate, sport seats, overhead console with compass and outside temp, heavy-duty front tow hook, 115x.400w deck-mounted power point, unique TRD graphics, TRD, Hill-start Assiste Control, Downhill Assist Control. Looking tough without going overboard, Toyota Tacoma is recognizable as a Toyota product. With its trademark lower air opening framed by a body-color extension, the protruding black plastic inner grille and front-end trapezoid-shape give it familiarity among truck buyers. Tacomaâ€™s overall length varies by body style, while the Regular Cab offers a lot of cargo space, the Access Cabs feature large dual rear auxiliary doors, opening up to 2 fold-up seats with center console. Although two additional passengers can ride back here, it works out even better for extra â€˜stuff,â€™ and a couple of dogs! The Tacoma is a great riding truck, with little bounce or harsh reactions. With all the amenities available in trucks today, itâ€™s easy to understand why folks are opting for a truck. Even highway driving is pleasurable and parking not as difficult as one would think. Handling is good, especially when maneuvering curvy ramps; roll and lean are minimal. When switching into 4WD, one has only to twist a rotary knob. We enjoyed our week in the new 2013 Toyota Tacoma Access Cab and left it wondering â€œWhy not?â€ Take a test drive; who knows, you might be persuaded. EPA fuel economy:Â 16/21 mpg., 18 mpg. To be built-as always-at Fordâ€™s Flat Rock Assembly Plant, the 50th Anniversary Mustang has been built from the ground up, including all of its raw appeal associated with the pony car. With an all-new shape and clean-sheet design, Mustang will offer a fastback and convertible, and will retain its familiar long-sculpted hood and short rear deck. Several key design features define the all-new Mustang and include a lower, wider stance with shorter roof height, wider rear fenders and track; a sleeker profile on the returning fastback, three-dimensional tri-bar taillamps with sequential turn signals, as well as a contemporary execution of the signature shark-bite front fascia and trapezoidal grille. Mustang convertibles will offer a standard multilayer insulated cloth top, providing a more upscale appearance and quieter cabin. Lowering twice as fast as the current Mustang convertible top, the new cloth top has a sleeker profile when folded. Information and controls on the Anniversary Mustang are more accessible and tactile, the cabin roomier and the car wider. The new rear suspension contributes to improved shoulder and hip room for passengers (appealing to the Baby Boomers perhaps?). For golfers, you will welcome a more usable trunk:Â a new shape that will accommodate two golf bags. Offering more options than in any other Mustang year, the 50thAnniversary model sportsÂ upgraded V-6 and V-8 engines, as well as an all-new 2.3-liter EcoBoost engine. 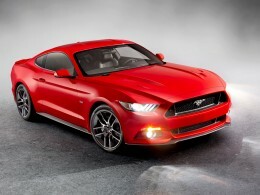 Continuing is the Mustang GT, with updated 5.0-liter V-8 (420 hp. ), valve train and cylinder heads, and new intake manifold to improve low-speed breathing for better fuel economy, idle stability and emissions. As expected, the new 2015 Mustang will feature all-new technology, new front and rear suspension systems, new perimeter subframe, more predictable wheel control, powerful brakes and more. Innovative technology will provide drivers with enhanced information, control and connectivity. Such features include a push-button start to Fordâ€™s SYNC and MyKey from Intelligent Access, plus available Track Apps, MyColor gauges and new Shaker Pro audio system. Customization is the key. More advanced technology from Ford includes a stability control system tuned to maximize Mustangâ€™s dynamic capabilities, launch control on the GT, and driver-assist features including Blind Spot Information System with cross-traffic alert and adaptive cruise control. Those who are interested in tracking Mustangâ€™s history throughout the years can go to Fordâ€™s website http://ford.to/allnewmustang, or http://ford.to/FordMustang50. The 50-year milestone list can be found here, along with such trivia as interesting specs, and a timeline. For instance, over the years, Mustang has been as short as 175 inches, and as long as 189.5 inches. The wheelbase has gone from 96.2 inches to 109 inches and engines ranged from 2.3-liter 4-cylinder, all the way up to 420 cu. Inch big block V-8â€™s, as well as a variety of V-6 and V-8 engines. Ford Archives provided the technical specs for the Mustangs over the years, 1965-2005, and old brochures are available. This writer was particularly interested in the Mustang iterations of the early seventies: The Mustang II models. One never sees these cars on the road, or for sale anywhere. They seem to have disappeared (maybe to some other country?). Itâ€™s possible they have little value toÂ collectors. In 1974, this completely redesigned second-generation Mustang hit the road; a radical departure from the 1973 model, the Mustang II arrived in dealerships just as the Middle East oil embargo caused gas prices to escalate. It was then that new safety and emission standards came on the scene, affecting all automobile manufacturers. Smaller and lighter than Mustangs of the past, the Mustang II came with a standard four-cylinder engine; No V-8. Although a lean time for big muscle car and performance car fans, the Mustang II was innovative for its time as the sales of small cars exploded from 23 percent in 1964 to more than 40 percent by the early 1970s. 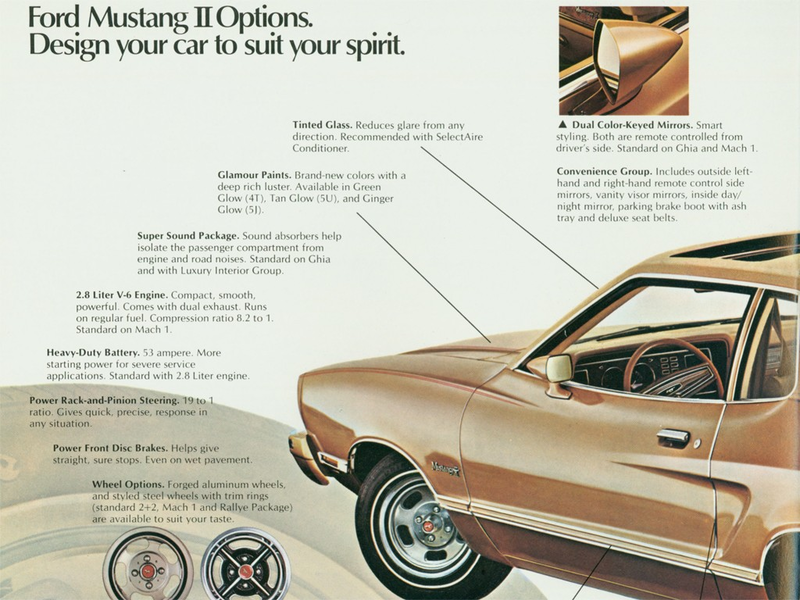 Engineered from the bottom up, the Mustang II debuted in the fall of 1973, and offered both a 2.3-liter, 4-cylinder and 2.8-liter, V-6 engine. Due to the carâ€™s reduced weight, performance remained comparable to the previous generation Mustang. Ford added a 302-cu. In. V-8 engine in 1975, and in 1977, a 302 V-8 with 247 lb. ft. torque. Featured on the popular Charlieâ€™s Angels TV show, the Mustang II received good play and remained technologically advanced for its time, with standard rack-and-pinion steering, front disc brakes, well-appointed interiors and full instrumentation. Named â€œCar of the Yearâ€ in 1974 by Motor Trend magazine, the Mustang II sold nearly 400,000 units in its first year and enjoyed a five-year run. Stickering at only $3,000, this version of the Mustang also offered a loaded Cobra II for about $4,800 in 1978.Â This â€˜forgottenâ€ Mustang stood up to the competition and was a success by many standards. Mark your calendar for the 2015 Mustang launch date: April 14, 2014. TOLEDO, Ohio, Dec. 2, 2013 /PRNewswire/ — During its first 49 years of production, the Ford Mustang has come to evoke a variety of emotions in its customers â€“ freedom, optimism and being true to one self. To commemorate becoming the newest member of an exclusive club â€“ 50 years of continuous production in 2014 â€“ Mark Feldstein & Associates, inc. (MFA) is introducing a limited edition 50 Years of Mustang Desktop Sound Clock Thermometer. (Photo: http://photos.prnewswire.com/prnh/20131202/CL24914 ) MFA, a Product Development Company and Importer of innovative Housewares and Gifts, is one of only 50 companies Ford has chosen to sell a variety of licensed products that will carry a distinctive Mustang 50 Years logo. The logo, crafted by Ford designer, Michael Thompson, features the Mustang’s trademark galloping pony in silhouette over the character “50 YEARS.” The one-of-a-kind desktop clock thermometer features a replica of the 1965 Mustang instrument panel, conveying an attitude of strength, passion, and quality. To demonstrate the power of the Mustang, an authentic engine sound from the 1965 model roars at the top of each hour. “The Ford Mustang has played a major role in the automotive industry for the past half century,” said Mark Feldstein, President, Mark Feldstein & Associates. “The 50 Years of Mustang Desktop Sound Clock Thermometer uniquely reflects Mustang’s rich history and will be an ideal collector’s item for auto enthusiasts.” Manufacturer’s Suggested Retail Price for the 50 Years of Mustang Desktop Sound Clock Thermometer is $49.95, and will be available in early 2014. Watch your retailers or keep tabs on the website.